Why did you produce this print edition of your online zine? It was time to produce a new sample issue to give out for promotions and contests. Apex has given away over 1,000 copies of the 2015 Sampler. I don’t have any concrete data regarding whether having the sampler has helped boost our readership, but I do know that our authors and editors appreciate having a physical product they can handout at events. Yeah, I get that. But this “sample” issue looks like a full-sized magazine. Isn’t that a lot more work and cost to produce? You’re right. It is a lot more time and work. 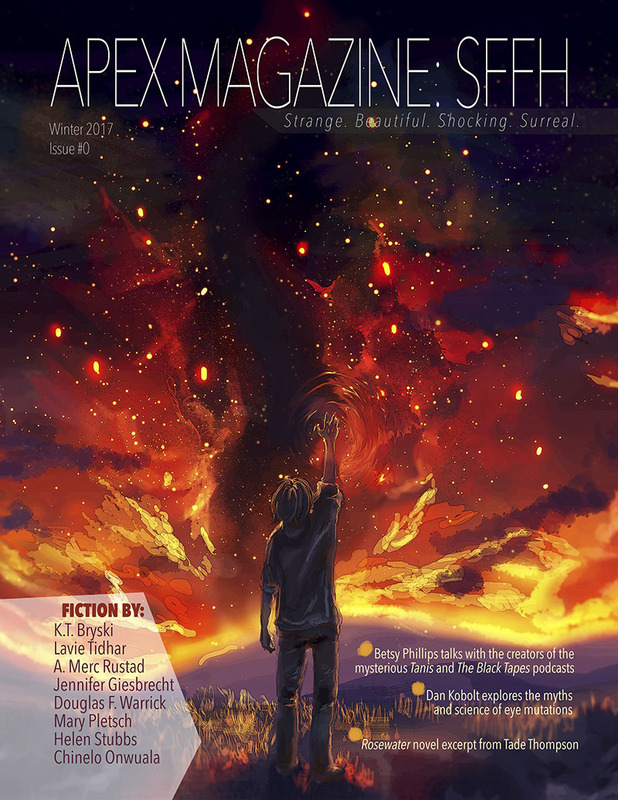 However, the dream is that there is sufficient reader interest to justify doing a quarterly print edition…perhaps a reboot of the old Apex Science Fiction and Horror Digest. And that’s why you’re selling this for $7.99? Apex will still give away free copies for promotional reasons, but will be selling issue 0 at events this year to help offset costs and to gauge reader interest. This issue is filled with reprints. If you do a new print edition will it have original work? Is this layout the look and feel we can expect in potential future issues? That’s two questions. Cheater.The monthly content you see on Apex-Magazine.com would be collected and released quarterly in the print edition. The print edition with all three month’s worth of content would be released before the content becomes available online.I’m sure the layout will be refined and tweaked to look better over time. It’s part of any publication’s maturation process. It’s entirely possible (if not likely) that this is a one-shot. If a few years down the road I want to revisit the concept of a quarterly print publications, then I can still start at issue 1! But mostly I’ve always wanted to do an issue 0 of something. It feels special. Now that the issue is finished, do I feel special? Always. Would love to subscribe to a quarterly paper edition. Any chance you’ll be offering readers a way to do that in the future? If there’s enough sustained interest. I am hesitant to take subscription money while I’m still figuring out if I can commit to doing four issues. Hard copies are the best!! Tired of reading off a screen. Hope this turns into a regular thing. I’d love for it to become regular!